Two labels, were the home to some of the greatest artists who during the sixties and seventies, released some of the greatest Southern Soul music ever recorded. These were Hi Records, home to Al Green, Otis Clay, O.V. Wright and Ann Peebles, all produced by the man with the midas touch, Willie Mitchell. Meanwhile, Rick Hall’s Fame Studio had Arthur Alexander, Arthur Conley, Wilson Pickett and the lady who gained the title the First Lady of Southern Soul, Candi Staton, recorded some brilliant Southern Soul music. Between 1969 and 1972, Candi released three albums and had sixteen R&B hit singles. During that period, Candi established her reputation as one of the greatest female soul singers. Miss Staton recorded some of the grittiest kinds of Southern Soul in the early ’70s – a far cry from her “Young Hearts Run Free” era. Now personally, I loathe “Stand By Your Man”, and it speaks volumes for Staton’s abilities that she can turn even a dirge as overwrought as this into something soulful. The beat is considerably funkier than on the original Country cut, and the gutsy vocal… well… there is no comparison. But; to each his own. Nonetheless, this LP really starts happenin’ when Candi segues through the slow burning, gospelfide wailer “How Can I Put Out the Flame“. Crying horns and mourning backing vocals give this beautiful ballad an eerie sense of despair that is reprised on several more tunes here. Musically a bit more upbeat, the lyrics to “Too Hurt to Cry” are steeped in the same sense of helplessness. The thick horns here sound almost jeering when they slide in and out on the chorus, while soft, shimmering strings give a sensitive edge to the otherwise fatback drum ‘n’ bass backing. 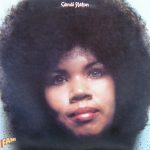 And the beat goes on, as Candi delivers a gutwrenching vocal on the quiet but intense “He Called Me Baby“, a gorgeous mid-tempo soul groove where the trumpet underscores each verse Staton sings. Again, a ‘less is more’ string arrangement is applied here and it works very well. After “Sweet Feeling“, the shufflin’ beater that was also culled from Candi’s first album, there’s the lazily propelled country soul ballad “To Hear You Say You’re Mine“. Sparsely arranged, the spotlight is firmly on Staton’s amazing voice. Also features a deep adlib, during which a Hammond caresses the already delicate melody. Up next is “What Would Become of Me“, another incredibly sad wailer that is more abundantly embellished – french horns, piano and that cracklin’ ‘Bama guitar – while Staton builds the tune up to a frantic finale. Essential album by one of the most talented Queens of Southern Soul. Candi knows how to lay it down. I hope a lot of our young people get the opportunity to hear this beautiful lady sing! Thanks for another exceptional album. Once again a fantanstic up … Thank You!